The Pyongyang Marathon has been a popular event for locals since 1981. This race is now also one of the main events on North Korea’s tourism calendar after finally being opened up to tourists in 2014. That year, we helped 92 people become the first-ever foreign amateurs to take part in this unique race. This year — in April 2016 — we took more people to the Pyongyang Marathon than ever before, with close to 600 of you joining Team Koryo on a marathon tour of North Korea’s capital. It was one of our favourite trips of the year thanks to the incredible atmosphere that greeted us, and our tourists, upon entry into the stadium where the race began, with tens of thousands of Koreans cheering everyone on. Running through Pyongyang’s streets, without guides, and alongside locals, was also a particularly special experience — especially given it’s the only time of year that visiting foreigners are allowed to move through the city unaccompanied and under their own steam. Add in the enthusiastic crowds that lined the course, offering even the slowest of us that extra bit of support, and you have the recipe for the most amazing of adventures. 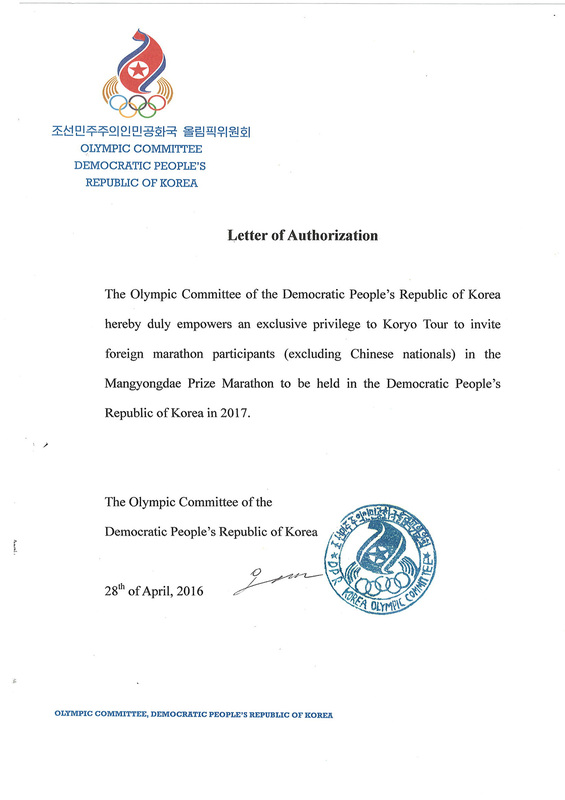 Due to the success of our 2016 marathon tours — with Koryo Tours providing around 80 per cent of all foreign runners who took part — the DPRK Sports Ministry and the Pyongyang Marathon’s Organising Committee decided to grant us the exclusive rights to bring non-Chinese amateur runners to the event in 2017. So, if you came with us this year, and enjoyed it so much that you’d like to go back, then please do drop us a line. Or if you have not yet had the chance to experience this extraordinary event, but would like to have a taste of it for yourself, then please do check out our 2017 Marathon Tours here. We’d be glad to have you along with us come April 2017! One word of warning, though: spaces on the planes to get you there and back are becoming extremely limited during this period, and the deadline for Marathon Tour applications is also soon upon us, with the shutters coming down on new sign-ups come the end of January 2017. So if you'd like to take part in next year’s race then don’t delay. Book today, and then you can focus on your training and getting your body in shape — both your legs for the race itself, and your hands for all the high-fives to be had with the local citizens along the route. Based on how this year went off we can guarantee you a stunning experience you will never forget! There will also be running shirts, finisher’s medals, prizes for the winners, and a party afterwards (that you’re all invited to, of course). Plus, we also use this particular event to raise extra funds for our humanitarian projects (more on this later in the week). So if you run with us then you will be part of something great as well as something good!